This is a media release cross-posted from the Aquarium's News and Updates Blog. Find out how you can support the Aquarium and their efforts to rescue and protect endangered animals here. With nearly 150 sea turtles rescued from Cape Cod beaches over the past four weeks due to hypothermia, the New England Aquarium’s sea turtle hospital is over capacity, and more critically ill turtles are arriving every day. 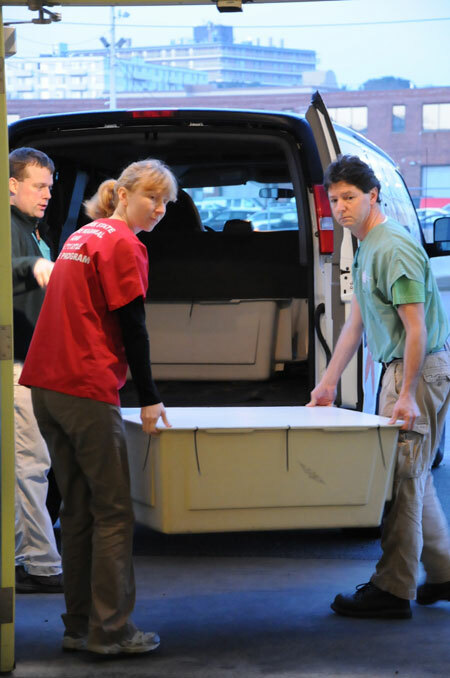 Head Aquarium veterinarian Charles Innis loads loggerheads for transport to the airport with a volunteer marine animal rescuer from New York. Recently, the Aquarium has been transferring re-warmed and stable sea turtles to other marine animal rescue facilities all over the east Coast. Monday, four large loggerhead sea turtles flew from Massachusetts to a sea turtle hospital in southern Georgia courtesy of Polar Beverages of Worcester, MA. 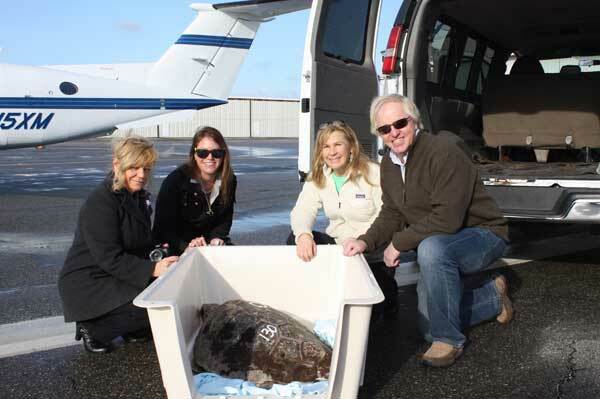 The Crowley family, owners of Polar and longtime supporters of the Aquarium, arranged for the sea turtle express. 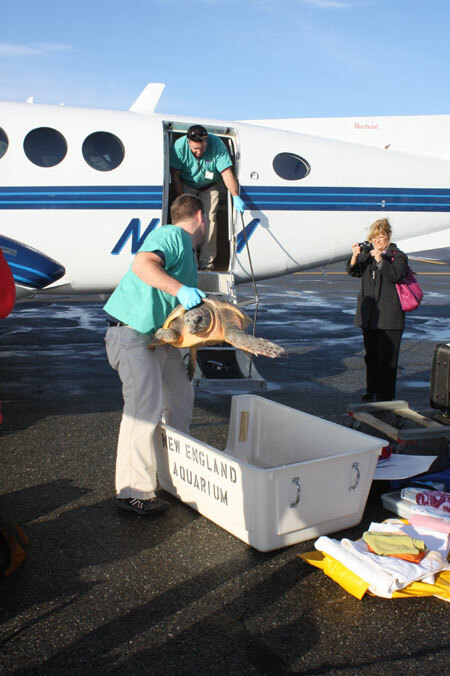 New England Aquarium rescue biologists loaded the recovering cold-stunned loggerhead sea turtle on to a private plane owned by Polar Beverages of Worcester, Mass. for transport to a sea turtle hospital in Georgia. The near record number of stranded hypothermic sea turtles has been complicated by the record number of much larger loggerhead sea turtles that are stranding. The Rescue Team will post more about this special transport along with all the action in the Animal Care Center in the days and weeks ahead. In the meantime, many thanks to the people and institutions helping out during this extremely busy stretch! From the MSPCA bringing clean towels and doing some laundry to our friends at Polar shuttling turtles to distant rehabilitation facilities to the individuals volunteering hours helping with turtle treatments, there are a lot of people to thank. And during this incredible year, there are a lot of turtles to introduce! Stay tuned.